The Ultherapy® treatment is the only non-invasive procedure FDA-cleared to lift the skin on the neck, under the chin and the brow. Ultherapy is also the only non-invasive treatment specifically FDA-cleared to improve the lines, wrinkles and the appearance of the décolletage (upper chest). Our practice now offers Ultherapy® treatment for the décolletage (upper chest). 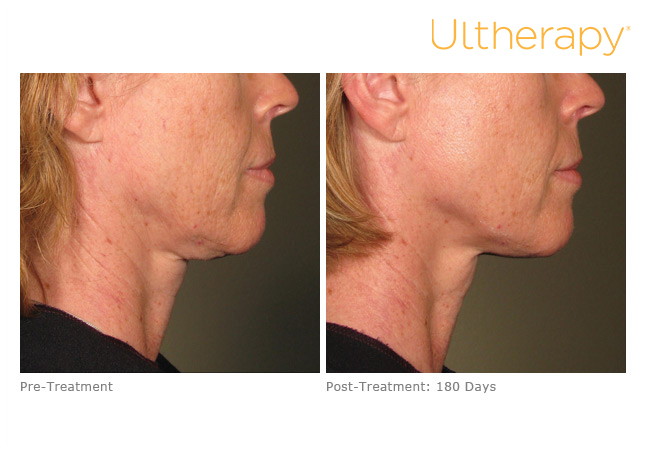 Ultherapy effectively lifts and tightens tissues in the face, neck and décolletage using ultrasound energy. This advanced procedure targets the deep layers of tissue normally adjusted during a facelift or neck lift, stimulating collagen to achieve a more youthful appearance. It can be used to treat sagging skin on the cheeks, brow, neck and chest while leaving the surface of the skin intact. During the Ultherapy procedure, while using ultrasound, an applicator will be placed on the skin to allow your provider to visualize the deep layers of skin and muscle. Focused ultrasound energy will then be delivered to that treatment area. This energy initiates the body’s natural response to stimulate the growth of fresh, new collagen and strengthen weak collagen. The Ultherapy procedure can be customized to address a patient’s specific needs, with some treatments taking as little as 30 minutes to complete. The Ultherapy treatment involves no downtime and minimal side effects with gradual, natural-looking results. Patients will be able to return to work and their regular activities immediately after treatment. Some patients may see an effect right after their treatment, but the results begin to appear 4-6 months as new collagen builds, gradually lifting and tightening skin on the treatment area. In order to achieve their desired result, some patients may wish to undergo a second treatment. While Ultherapy does not duplicate the results of a facelift, it’s an exciting alternative for those who are not ready for surgery—and for patients who wish to extend the effects of cosmetic surgery. You can find more information on Ultherapy here.